One of our two pound heavyweights latched onto my middle finger today with both paws. The demonic creature proceeded to squeeze as hard as he could, then release slightly, then squeeze even harder. I foolishly tried to drown him in the tank and probably would still be stuck there, standing in the seafood store with my hand in the crab tank and a monster crab attached to my finger, if our crab lady Sue hadn't rescued me by prying open the giant's pinchers. 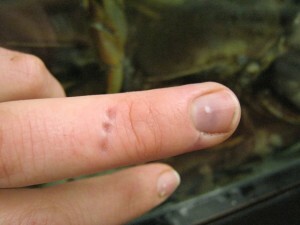 Could a crab actually take off a human finger? Probably not one this size, but the thought did cross my mind.